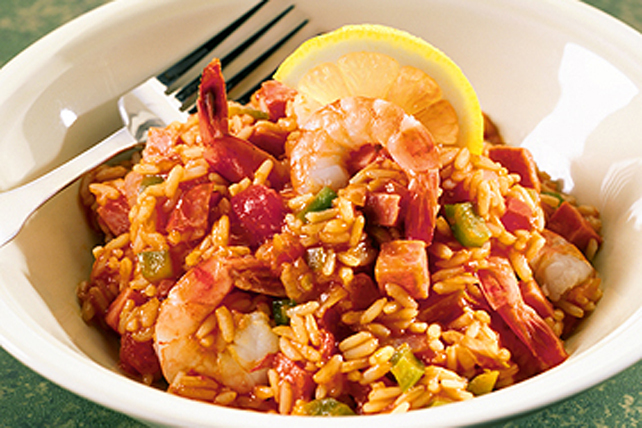 Since this easy-to-make jambalaya can be on the table in less than 1 hour, it's the perfect recipe to prepare on a busy weeknight. Heat oil in large skillet on medium heat. Add green peppers, onions, garlic and crushed pepper; mix well. Cook 5 min., stirring frequently. Add all remaining ingredients except shrimp; mix well. Bring to boil; cover. Simmer on medium-low heat 20 min., stirring occasionally. Stir in shrimp; cook 2 to 3 min. or until shrimp turn pink, stirring frequently. Prepare recipe as directed, omitting the shrimp and/or substituting chopped cooked chicken for the ham.